WDW Magic for the iPhone, iPod Touch and iPad is designed to maximize the enjoyment at Walt Disney World by minimizing the time you would otherwise waste standing in long lines or looking for your favorite attractions. 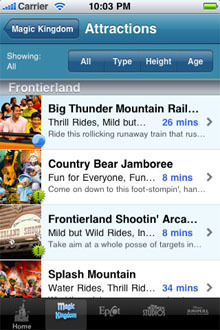 See the wait time for Big Thunder while you're in line for Space Mountain. See which Tomorrowland attractions have the shortest waits right now. Find out if Toy Story Mania! has a long line while you're on the Studio Backlot Tour, without having to walk across the park. See the current wait times at every attraction and the estimated wait times for the rest of the day. Spending the day at Walt Disney World should be fun for the entire family but waiting in long lines to visit top attractions can turn a great day into a frustrating experience. You can spend considerable time rushing around the park while attempting to outsmart the crowds that seek the most popular attractions. 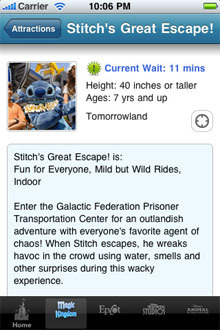 On busy days wait times for the top attractions can sometimes exceed 90 minutes. The quest to visit best-loved attractions can be hindered by spending too much time waiting in long lines. 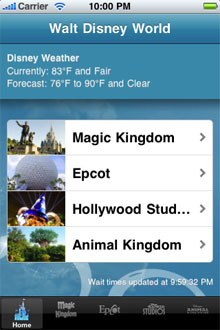 Fortunately with WDW Magic one can use these apps to quickly navigate to the shortest lines. 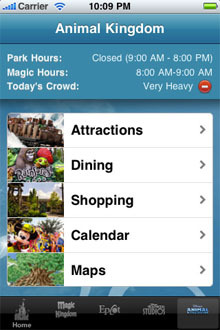 From real-time attraction wait times, detailed information, shopping and dining guides to daily event calendars, the WDW Magic app helps you better enjoy your experience and minimize wait times at attractions at Walt Disney World theme parks. For the past few years we have been obsessively researching wait times at all 4 Walt Disney World parks, collecting and processing a massive amount of data along the way. WDW Magic uses this data to help you efficiently tour the parks and avoid the crowds and get real-time attraction wait time, not to mention detailed guides and more. The wait times, maps, guides and calendars offered are available for Walt Disney World's Magic Kingdom, Epcot, Disney's Hollywood Studios and Disney's Animal Kingdom theme parks in Orlando Florida.